6/49 GO! is Lottoland’s brand-new instant lotto betting product, with a fresh draw on the hour, every hour! It’s a classic style 6+1 lottery, with a huge guaranteed €1 MILLION jackpot and three additional bonus games that give you more chances to win some serious wedge. Best of all, if you don’t match a single number, you’ll get your money back! Simply pick six numbers from 1 to 49, or select the QuickPick option (Quick+1) and this automatically select the numbers for you. You can also pick your “SuperNumber”, which is the last digit of your ticket number, from 0 to 9. After this, just click “submit” to proceed to the checkout. You can play this exciting draw for just €1. 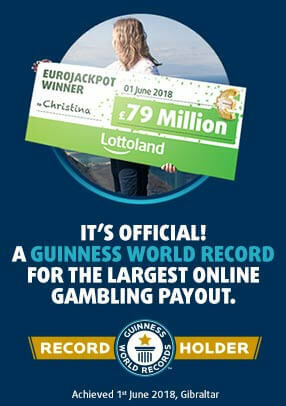 Just like many of the quick play lotteries around the world, the Lottoland 6/49 GO! draw is based on an independently audited and verified random number generator, authorised by the Gambling Commission. The draw picks 6 numbers from 1 to 49 and 1 number from 0 to 9, on the exact hour, every hour. The hourly draws take place 24 hours a day, 7 days a week. The guaranteed €1 MILLION jackpot is won when a player’s ticket matches all six main numbers and the “SuperNumber”. A single line costs just €1 . Spiel 77 costs €2.50, Super6 costs €1.25 and GlücksSpirale costs €5. How do the extra games work? Spiel 77 is a prize draw based on your ticket number. If all 7 digits of your ticket number match our randomly generated 7-digit number in the right order, you’ll win a huge guaranteed jackpot of €177,777! There are lower tier fixed value prizes available for matching the last 6, 5, 4, 3, 2 and 1 digits. Super6 works in very similar way to Spiel 77, but only 6 numbers are drawn. These numbers correspond to the last 6 digits on your ticket number. Once again, you need to match the right numbers in the same sequence as those drawn. There are 6 fixed value prizes, starting with an guaranteed jackpot of €100,000. GlücksSpirale is another bonus game based upon your ticket number. Match the digits and the order in which they are drawn to win a prize. If you're lucky enough to match all 7 numbers in the correct order, you will win a monthly prize of €10,000 – paid out each and every month for the next 20 years. You’ll find a full breakdown of all the odds for each prize tier, together with estimated returns, in the paragraph below. Winners will receive an e-mail confirmation. Any person who wins a sum of over €10,000 will receive a phone call to inform them and congratulate them on their win! Why should I bet on 6/49 GO!? 6/49 GO! offers a chance to win €1 MILLION from just €1 a play. As well as the chance to max out your chances of a win with the three side games, and best of all if you don’t match a single number, you get your money back!